This weekend, Crown Prince Frederik of Denmark celebrated his 50th birthday with a grand gala at Christiansborg Palace in Copenhagen. 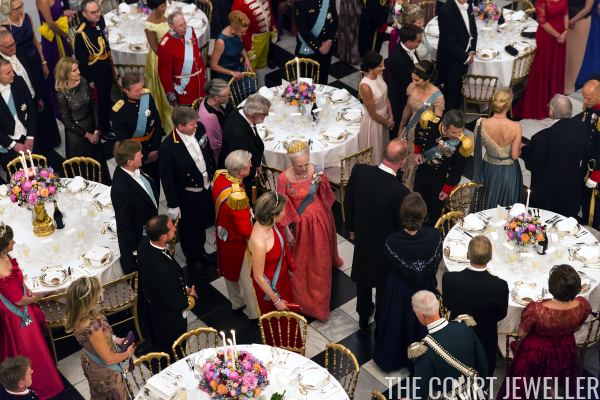 We covered all of the royal tiaras present at the event in a big post over here, and today, we've got even better views of some royal pieces on display! We've got a good look here at the heavenly diamonds worn by Queen Maxima of the Netherlands, including the Dutch Diamond Bandeau, Queen Juliana's Diamond Earrings, and one of the family's large diamond rivieres. You also get a glimpse of Maxima's recent favorite bracelet stack, which includes the diamond bracelet featuring her family's initials. Also note the large diamond brooch used to secure her Order of the Elephant sash. 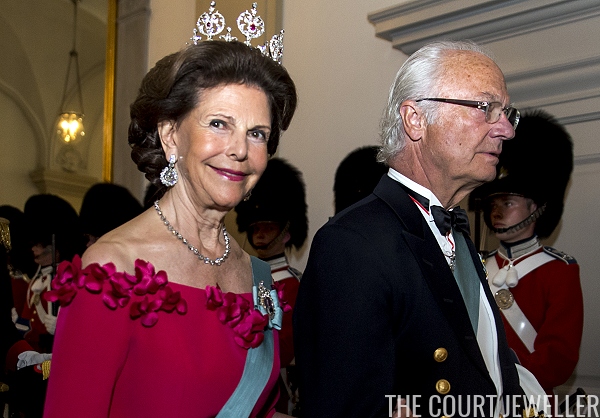 This angle on the jewels worn by Queen Silvia of Sweden gives us a good view of the antique Karl Johan Earrings -- and a good sense of the height of the King Edward VII Ruby Tiara. 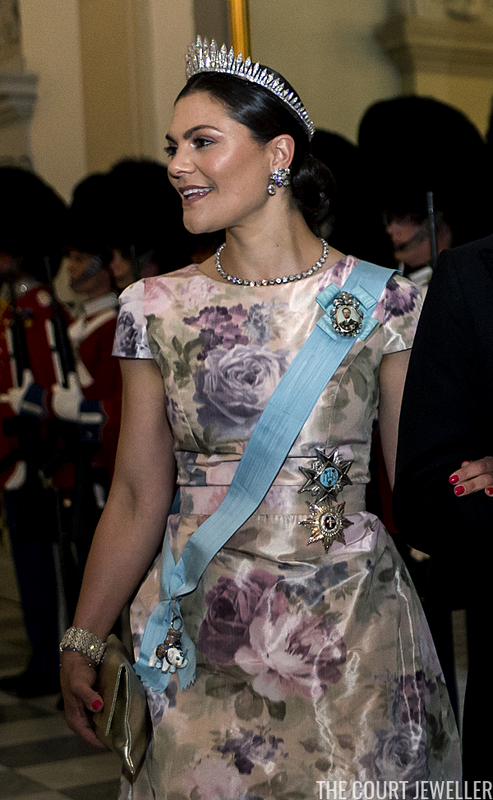 Crown Princess Victoria of Sweden was decked in diamonds for the occasion, including the Baden Fringe Tiara and the beautiful diamond floral earrings from the Brazilian Parure -- and this angle also shows that she wore the fantastic diamond zig-zag bracelet from the family vaults. 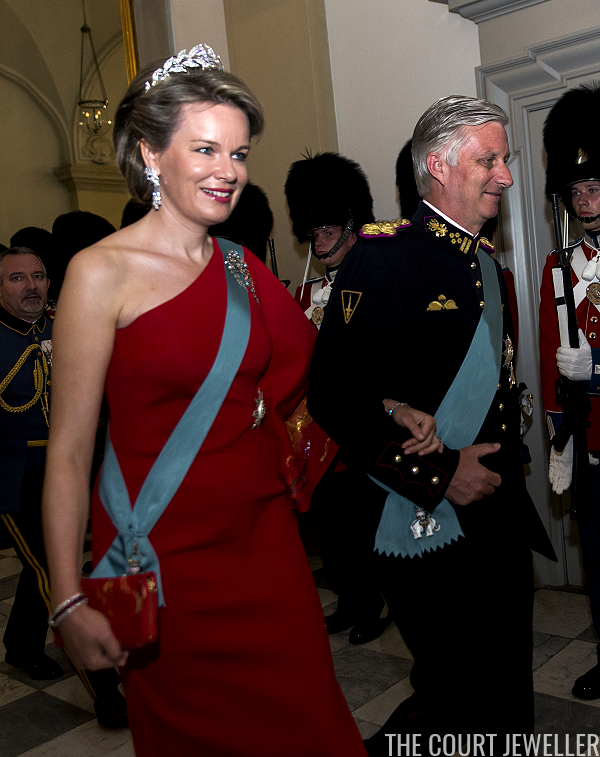 Queen Mathilde of the Belgians also sparkled in incredible diamond jewels for the gala. We spotted the Brabant Laurel Wreath Tiara and Queen Fabiola's Diamond Fringe Brooch in our earlier post, but this angle also shows that Mathilde wore Fabiola's diamond and ruby bracelet. 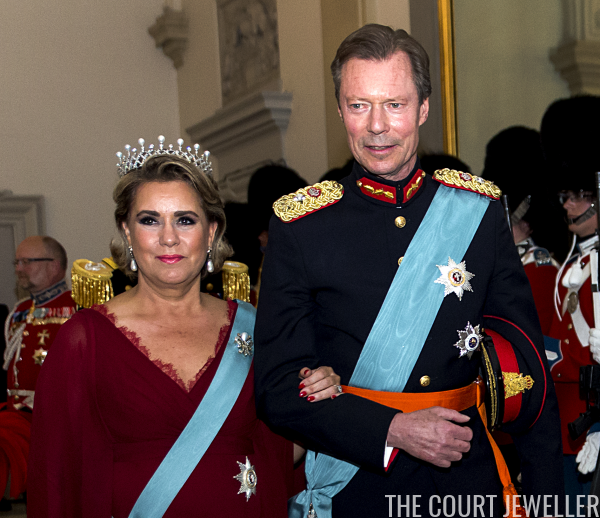 This is a much better view of the jewels worn by Grand Duchess Maria Teresa than we had earlier. Along with the Chaumet Choker Tiara, she wore her beautiful pearl drop earrings -- and Princess Ingeborg's Pearl Fleur-de-Lis Brooch (which, of course, belonged to a Danish princess). 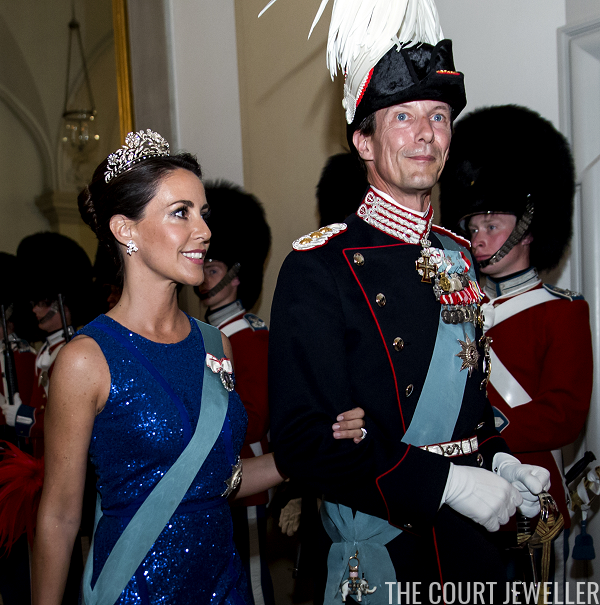 Along with Princess Dagmar's Diamond Floral Tiara, Princess Marie of Denmark wore a glittering pair of diamond earrings, which were made by Christine Hvelplund. And along with the dainty Alexandrine Diamond Drop Tiara, Countess Alexandra of Frederiksborg wore dangling diamond earrings and a diamond-studded bangle.